⇨ Purification: the NSF certified components and Dow Filmtec brand reverse osmosis membrane work together to remove dissolved solids like heavy metals, nitrates, lead and fluoride; sediment, turbidity, and rust; and chemical contaminants like chlorine, chloramines, pesticides, herbicides and gasoline additives. Additional purification is available with the iron and UV filters, and the permeate pump upgrade. For more information please see the specific product page. All Home Master RO systems now use powerful catalytic carbon filtration media in the carbon pre-filter to treat the very persistent chemical disinfectant chloramine. Ordinary carbon filters are unable to effectively remove this stubborn contaminant that is now being deployed nationwide to replace chlorine. It takes the more advanced carbon media known as catalytic carbon. Advantage - Home Master RO! ⇨ Leak elimination: The leading competitors canister type RO system uses the same filter housing year after year, subjecting it to constant high water pressure, micrororganism build-up, water erosion, and wear from maintenance. Only the filter element is replaced. After about 5 years the walls and seals of the competitors canister filter housing begin to weaken and decay, eventually failing, potentially causing a substantial leak. The modular filters found in the Home Master brand Reverse Osmosis Systems are changed annually virtually eliminating this problem. Also by changing the modular all-in-one filters annually it leads to a more hygenic system. ⇨ Speed: The water flow from a typical home RO system will takes 40 seconds to fill a tea kettle or large pasta pot. This level of performance was unacceptable to our engineers who developed the Fast Flow Ro! kit for the Home Master RO which effectively doubles the water flow from the RO faucet! ⇨ User-friendliness: The first thing you will notice about the Home Master Reverse Osmosis system is that the filters are incorporated into the filter housing, so that when it comes time for the annual filter change, the filter, and the entire filter housing, are disposed of. This is to prevent flooding in your home and make your annual service easier. Just unplug and go - no tools required! ⇨ Efficiency: Home Master RO system uses high grade filters designed to yield 3900 gallons of purified water, with carbon filters made from catalytic carbon and with filtration down to 5 microns. Compression disks in the Home Master's advanced inline filters prevents channeling and dumping and permits an outstanding 8 full inches of carbon contact for greater purification. The competition typically uses lower grade filters made from coal carbon rated to purify just 1500 gallons of water because of the carbon grade and the insufficient carbon contact time made with a thin wall carbon block. The competition also uses recommends multiple filter changes per year in order to compensate for their poor quality filters. ⇨ Warranty: 100% total satisfaction guaranty for 30 days or your money back; 5 year limited warranty. Artesian Upgrade adds minerals to the water after the reverse osmosis membrane has removes virtually everything so that the product water is no longer acidic / balances the pH, improves the taste and provides 15-30 mg/L of the beneficial minerals calcium and magnesium. The Patented Full Contact version remineralizes the water twice restoring twice as many minerals as the regular Home Master Artesian so that the water tastes even better, has an alkaline pH, and provides 30-60 mg/L of the beneficial minerals calcium and magnesium. Permeate pump reduces water waste by up to 80%, increases water production by up to 50%, allows the storage tank to fill fuller, and produces slightly cleaner water by preventing "TDS creep." It is a non-electric pump that harnesses the movement of the waste water for power. Anti-microbial tubing prevents growth formation of microorganisms on the inside of the tubing. This upgrade replaces the standard system tubing with antimicrobial tubing. Refrigerator Connection Kit allows you to easily connect your Home Master to your refrigerator‚ water dispenser and icemaker. You may also use this kit to connect to some coffee makers, humidifiers, or other water using appliances (not dishwashers or laundry). Upgraded RO Faucets have more elegant finishes and styles, and deliver greater water flowrate. * All components meet FDA food grade materials standards, and/or NSF and California performance standards where applicable. In order to obtain a good understanding of the system performance it is important to sample the TDS at three points in the system - the feed water, the product water from the RO membrane before remineralization, and the final product water. In this manner you will know the starting TDS before purification, the TDS removal rate and the amount of minerals added. Please note that Artesian systems add minerals to the water in order to increase the pH. These minerals (calcium 95% and magnesium 5%) will contribute to a TDS reading. The TDS value added by the Artesian and Artesian Full Contact will vary according to a number of factors, including the life cycle of the Artesian filter. It will also vary according to contact time, so when testing the TDS of an Artesian system it’s important to replicate normal usage. 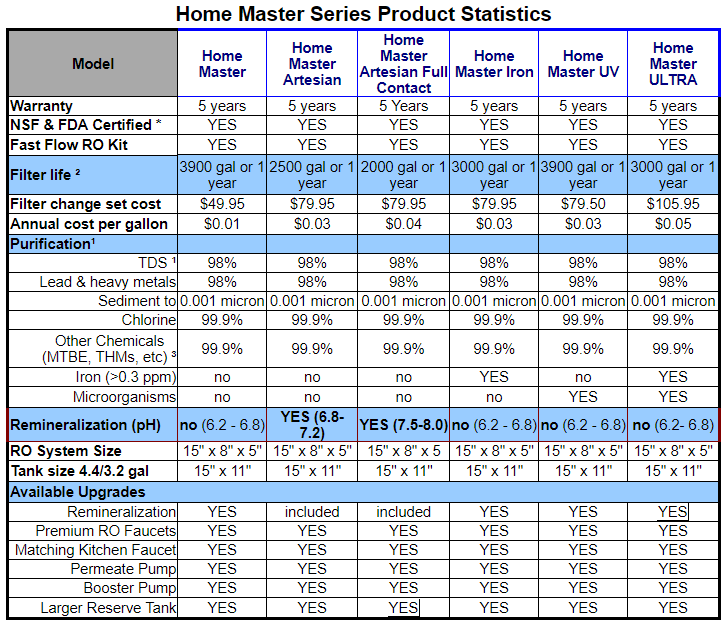 The Home Master RO system will reduce the feed water TDS by 98% and add 15-30 ppm (Artesian) or 30-60 ppm (Artesian Full Contact) under the following specific conditions: 250 ppm NaCl TDS, 77PSI, 70F, and 7.5pH. Water with low starting TDS or pH may not achieve the full remineralization levels. Your results may vary - based upon your water’s composition, temperature, pressure, pH and filter life. 1. Measure TDS from Kitchen Faucet: Draw water from kitchen faucet (Point A) into a clean sample cup. Measure the TDS and write down the result. 2. Measure TDS from RO Faucet: Draw water from RO faucet (Point C) into a clean sample cup. Measure the TDS and write down the result. For best results take the first few oz of water after the system has stood without use. Drawing out more than a quart of water will not represent normal use and will not product accurate, comparative results. 3. Close water valve feeding the system. 4. Close reserve tank valve. 5. Open RO faucet to relieve system pressure, leave open. 6a. Systems with Permeate Pump: On the permeate pump, locate the line coming out of the port labeled “permeate out”. Trace that line to the automatic shut off valve (or the termination point of the tubing) and remove the tubing from this port. Point the tube into a large bowl and turn the water to the system on. Allow the water to flow for a few moments, and then point the tube into a clean sample cup for testing. Test the water in the sample cup with the TDS meter. Repeat until a stable consistent result is obtained. Write down the result - (Point B). 6b. Systems without Permeate Pump: Locate the white elbow fitting at the bottom of the blue membrane housing in the center of the filter cluster. Trace the tubing from this white elbow to where it connects to the automatic shut off valve (a silver and white disk) and remove the tubing from this port. Turn the elbow with its tubing so that it points downward. Point the tube into a large bowl and turn the water to the system on. Allow the water to flow for a few moments, and then point the tube into a clean sample cup for testing. Test the water in the sample cup with the TDS meter. Repeat until a stable consistent result is obtained. Write down the result - (Point B). 7. Pressurize the Home Master® RO - Make sure unit is dry. Double check to make sure all valves are in the closed position, except for the main angle-stop valve, which should be open. Water should flow normally from your kitchen faucet. SLOWLY open the EZ adapter ball valve. You should hear water rushing through the system. Open the RO faucet to by flipping the lever up, where it should stay open. A trickle of water should be present after a few minutes. Close the lever on the RO faucet after the trickle runs clear, and allow the system to pressurize. When the system has pressurized and shuts off automatically; (IMPORTANT STEP) dry unit thoroughly, gently tug on each connection and check for leaks. Then open the reserve tank valve slowly. Allow reserve tank to fill for 2.5 hours or until full. The difference between points A and B will indicate the general health and effectiveness of your reverse osmosis membrane, and the reverse osmosis removal rate. The difference between points B and C will indicate the general health and effectiveness of your Artesian filter, and the remineralization rate.